Don’t you take a shower or bath EVERY DAY! A healthy and good smelling hen NEEDS to take a dust bath on a regular basis. Chances are if your bird stinks she does not have access to a dust bath and if she doesn’t have access to a bath, the probability is higher that your flock will carry lice and mites. For those of you that have watched chickens dust bathing, I think you will agree that it is not only comical, but shows your hens in the utmost state of contentedness. During the act of dust bathing, chickens will do their best to get as much “dirt” as they can all over their bodies down to the base of their feathers. This in turn actually cleans the chicken (see ingredients below) and will asphyxiate any pests that may potentially prey on them. If you let your hens free range and DON’T provide a dust bath in the coop/run, I guarantee that they WILL make a dust bath where your favorite plants are growing. If you do not let your hens free range, or they are limited to free ranging because of Winter conditions, than it is essential that they have access to a dust bath. The need is ingrained in their behavior and essential to their personal health. So…… why not build a dust bath in your chicken run? In order to get started, you will need a container for the dust bath. I only have 3 hens and an old apple crate that is around 12 “deep, 15″ wide and 24” long works well for this application. If you have a larger flock, you will need a larger container. I’ve seen kiddy pools used for this purpose and they appear to work well. 1) Builder’s sand (don’t waste your money on the more expensive kid’s play sand). 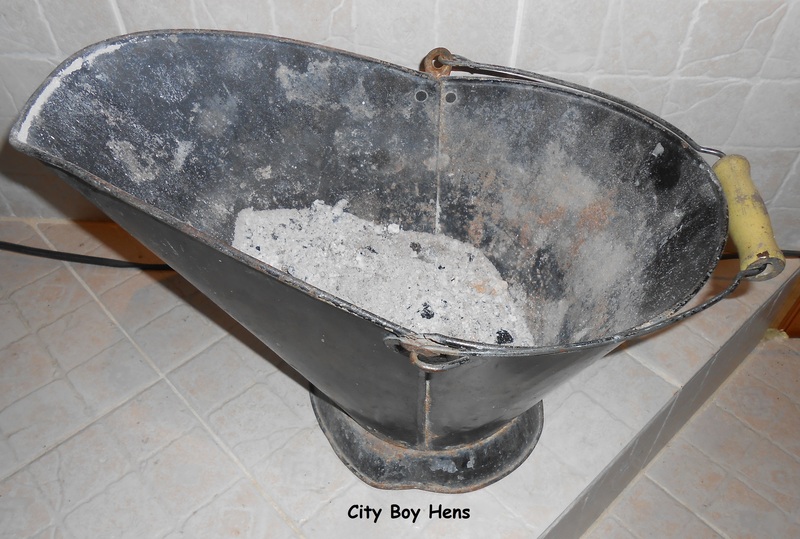 2) Wood ash – I get the ash from my wood stove and take out the larger charcoal pieces with a cat litter scooper. 3) Soil – If you are purchasing soil, make sure it is fertilizer, chemical and vermiculite free. 4) Diatomaceous Earth Make sure it is FOOD -GRADE and not for use in pools. The bag MUST read For LIVESTOCK FEED. See more on Diatomaceous Earth in on following page. 1) You find some of the “bath” contents on the floor of the run. 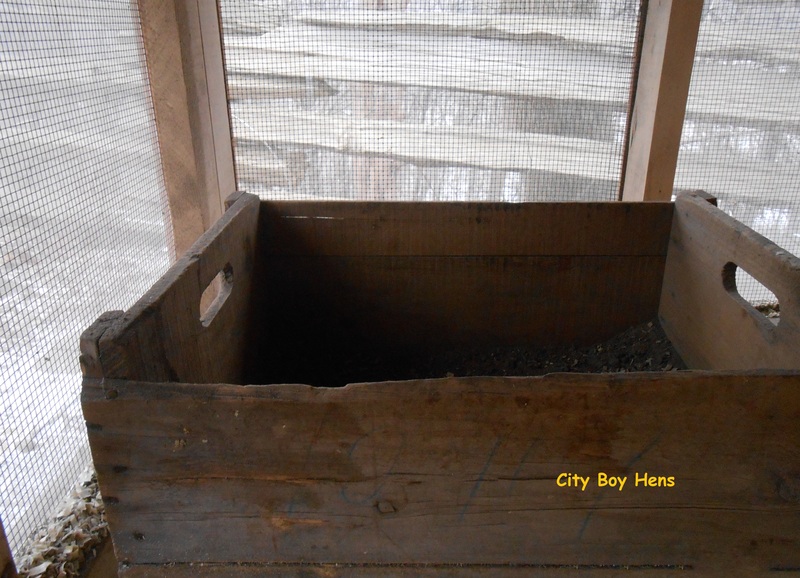 2) You see them nestled up together in the crate throwing dirt on each other. 3) They are free ranging and suddenly shake from comb to feet and a cloud of dust emerges around your hen. 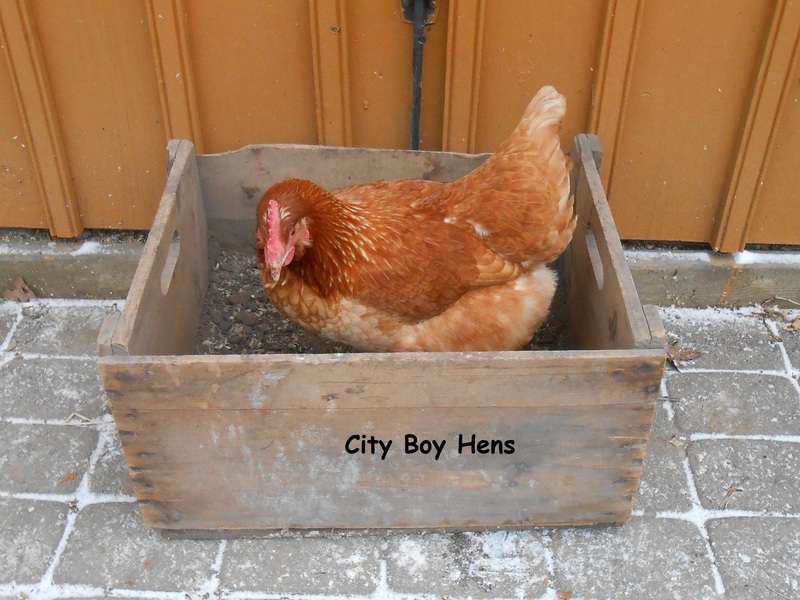 So……before it gets too cold or your chickens destroy your prized petunias, why not make them a dust bath. They’ll thank you with being vermin free and consistently giving you all the eggs that they are capable of laying. Interesting! We have city chickens…in our garage, and while they do get out every now and then for a run in the backyard,it isn’t often. I will be doing this for them. They will be happier chickens for it! I need to do this for my flock! We let them free range when we are home and on weekends so usually they dust bathe somewhere on our property or out in the woods but while they are in their pen it’d be nice to have a dust box for them. Thanks for the great post! Your girls will be very thankful. Hope you’ll drop by again. How did you get that shot of all three bathing at once? And I love the ‘sand, soil and swiffer’ caption. 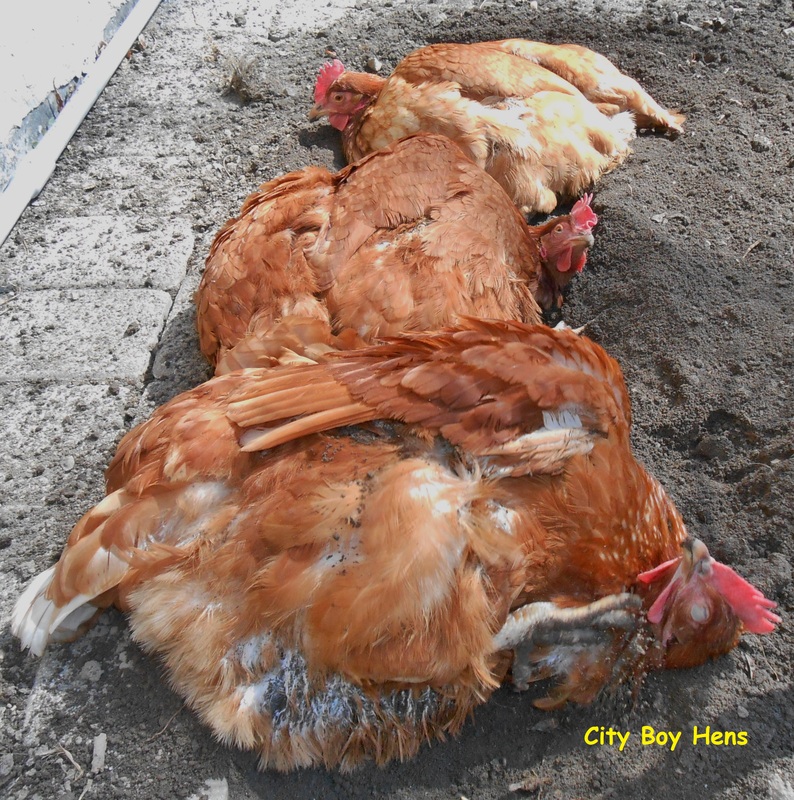 I made a dust bath in our coop – just out of regular red soil (they loved it) and finally found an online place and ordered diatomaceous earth and added it. It changed to a whiter colour. They have not used it since! I just don’t ‘get’ chickens sometimes. But I do find them happily dust bathing when they are out free ranging or even in the run. The shot was easy to take because the chickens get into a total ZEN mode when they are dust bathing. If you didn’t know better, you’d think they were dead in that shop. Never seen a creature more relaxed and enjoying themselves than a chicken dust bathing. I love watching our chickens in their dust baths. They do look so relaxed! thanks so much for sharing on The Home Acre Hop, can’t wait to see what you share this week! I plan on using sand for the run floor and as bedding in the coop instead of straw or pine shavings. As I understand it, the sand does many things like helps keep their feet clean and polished, makes for easier cleaning [like kitty litter], wicks away excess moisture, and also provides a “built in” dust bath. I can’t wait to sit outside in our garden and watch the swan dives and breast strokes! My only comment about the sand is that it may end up building about ammonia over time because the waste, at times, could be drawing in to the sand. Those turds aren’t always firm. I think you’ll have more odor with the sand than shavings, though the choice is ultimately yours. Hi, I have a question I dont know if it is a problem yet. My hens, I only have a mommy and 3 chicks so far, they seem to hang out underneath my house. I have heard that it can be a problem if they start bringing mites since I cannot clean under my house. I know, I have to build them an enclosure and put them in at night. But for now, will this dust bath next to the house save me from the mites? Why do you think they will get mites because they are under your house? I would be more concerned with predators getting them because they do not have a secure enclosure at night. If you are worried about the lice or mites, than I suggest you make a dust bath container though I suspect they are making their own “bath” under the house. My free-ranging chickies usually use my front garden bed or the soft soil by an old stump for their baths, but I am keen to set up a true bath in their run. I have seen some baths that use an old tire as the frame, but I didn’t know the ingredients. Thanks for this. In all my years of chicken rearing, I have never made them a dust bath. They free range (except in the winter), but they have access to their run and use their pine shavings for their baths. This is a cute idea, though- I just might have to give it a try for fun! I hadn’t guessed on wood ash- thanks for that tip :). I like the idea of the dust bath because it provides an extra layer of defense against lice and mites. Unfortunately, the pine shavings will not asphyxiate those critters. Hope you give it a try. Thanks for the “Like” and your comments. My girls get all glassy-eyed and start purring when they take a dust bath. Just from their reaction I can tell it’s an important part of their day. I love the photos of your girls, they’re just adorable! Thanks for the “like” and stopping by. This is great information! Our foray into the chicken world was six rescued hens a couple of years ago. The first time I let them out of the coop and saw them flop themselves down hard onto the ground, splayed out every which way, I thought I’d killed them! Now we have eleven hens, and they’ve found a soft sandy spot in the barn for bathing. They still flop themselves down into the oddest positions, but now I just laugh at them. They are comical to watch! What is the ratio on the ingredients for the dust box? Hi, and thanks for sharing on Homesteaders Hop. Chickens do love to dust bathe. 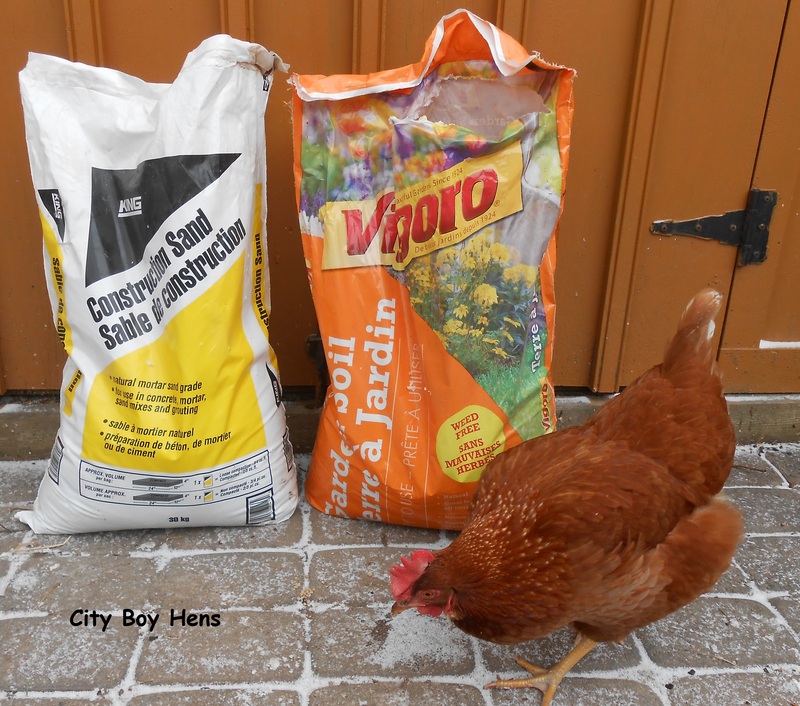 However, providing a dust bath in coop or run does not prevent free ranging chickens from creating more bathing areas out around yard and garden plants. Mine have 2 runs, one of which is covered, and therefore always dry. They make their own dust baths in that dry run. The are allowed to free range in afternoon, and still make more dust bathing areas around my shrubs. Not that I mind, just wanted to make it clear that providing a bathing area in coop or run does not prevent them from making their own near your garden plants. HI Janet & thanks for your comments. You are most correct that they will find a “special spot” while free ranging to dust bath. My hens continue to always go under my Japanese maple when they are out. But, since it has begun to snow and free ranging time is curtailed with shorter days, I do find it beneficial to provide the hens with a dust bath in their run. I know they enjoy it because I always see them in it. Congrats on the hens! They will be very appreciative of their new dust bath. Thanks for the great info! I gained so much from your post I included a mention of your blog in my post. I just read your post about preparing for the winter. We’re having unusually cold weather in Virginia where I live right now. I am going to make our little flock of 5 a dust bath because the ground is now snow-covered and frozen. You write very well and make the important information entertaining. Good luck to you and thanks for the ideas! Thanks for dropping by. Glad to be of help. Your hens will ENJOY their new bath. Hope you’ll stop by again. Thanks for the info on dust baths! I’ve gone on a lot of sites since we’re still pretty new to this chicken stuff, but yours is definitely the most entertaining and informational. I didn’t even think that my chickens would be missing their dust baths when the snow started to fly. We set up a container for them for bathing and they roll around in it and then jump out and scratch through all the sand they tossed over the side. Too funny! Thanks again for your advice! Glad the chickens are enjoying the dust bath and thanks for the compliment! My wife and I have about 200 happy spoiled chickens. Some even know their names, when called. They have always enjoyed the sand and shade under our large shed. We call it the “spa”. We have always put diatomaceous earth in their sand and in their water. It kills all intestinal parasites and any lice they may get from wild birds in the area. We use it with our rabbits and pigs, as well. Rabbits are very prone to ear mites. If you use diatomaceous earth there will not be mites. 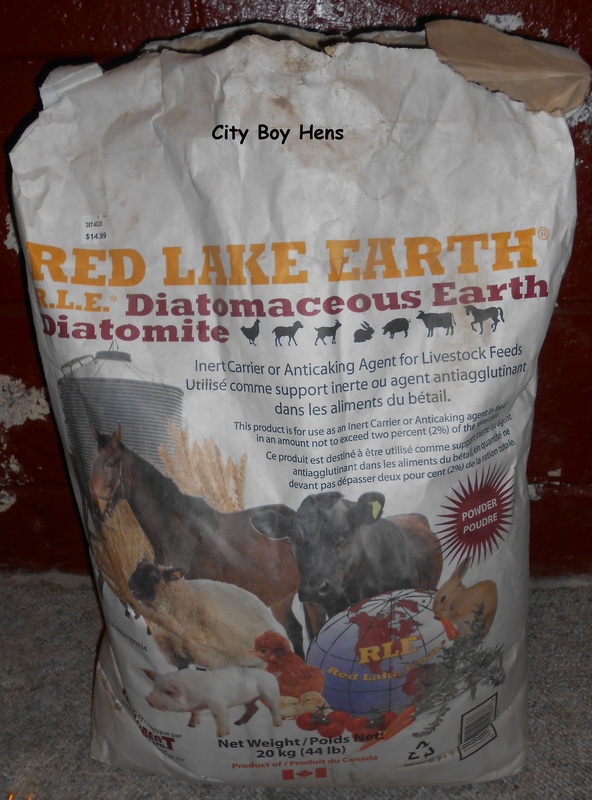 Pigs and parasites go hand in hand but diatomaceous earth in their water solves this problem. Along with diatomaceous earth in our organic garden, we are able to maintain a healthy farm. Love the idea of building a dust bath for my girls but is there anything else I can use instead of wood ash as I don’t have a wood burner/fire? I’d just use the other ingredients that were mentioned in the post. I have 6 lovely ladies in a large chicken tractor. I provided them with a large cat litter box with sand for dust bathing. They seemed to only be eating the sand. What am I doing wrong? I’d try adding the other 3 ingredients that I mention in the post and see what happens. Thanks! I think I worry over them too much…like a broody hen 🙂 I’ll give it a shot! Robert and Claudia again… DE in the nest box about every two months too. It is cheap, natural and very effective. Great web site. Keep up the great tips. DE kills all insects that have an exoskeleton but it does no harm to chickens. I have seen a lice infestation before and the chickens were never healthy again. It actually has a permanent negative effect on their immune system. A dust bath is best way to stop this before it happens. I’ll have to agree. I liked your reply and advice. Thanks for moderating and helping to stay on topic. Valerie was concerned that her chickens were eating sand. Sand is ideal for the chickens. They have no teeth so they have a “craw”. it is a bag of sand and rocks that they carry around their whole life. As soon as they swallow something it goes straight through the grinder. My grandmother showed this to me when I was a child when she was cleaning a chicken for supper. It was full of rocks and sand. When you pick up a chicken and carry them around you will notice a full round heavy stomach. That is her bag of sand. I don’t think Valerie is worried that they are eating sand. I think she wants to know why they are not dust bathing in the sand. But….thanks for your comments and sharing your memories of your grandmother. Thanks for all the help! I will try the other ingredients. Parasites are a big issue here in Michigan and I want my girls to stay happy and healthy! I heard DE is dangerous. Is that a myth? I use it for my hens. Best of success. Now…..stop worrying! My lovely chickens are not shy about bathing anywhere. How do I get them to use their dust bath? The post on making a dust bath was intended for inside the run. I don’t think your chickens will use it outside of confinement if there are lots of great dust bathing spots where you allow your chickens to roam. For what it’s worth, why not pick up a new bag without the additives. If you have an old tire kicking around, that too, will make for a good container for dust bathing in your run. i just got a bag of strictly peat moss and am going to use that!! Thank you!! Give them a bit of time. There’s a reason we associate the term “chicken” with apprehension or fear……just sayin’. What about throwing a bit of scratch in there and they can start off just investigating? With a wide ledge and lid to put on when it rains or snows. In a sunny area the Black makes the sand warm and toasty. A bag of Play sand and a cup of DE and they go to town. Play sand is less dusty than builders I think. I dump the old stuff on my garden every 6 months. Scrub, soap and bleach the container and start fresh. Used a kitty litter scoop until the girls figured out that one does not poop in the bath. Even the chicks purr and polish their fluff. It really helps with molting itch too. Sounds like your “girls” have some pretty nice digs. Thanks for your comments. HI, newbie to chicks in 2016. Our girls are about 6 weeks old and are now in the coop but not allowed to free range yet. I put them in the large dog crate for now to be outside. Thanks for the idea about the wood ash. Hubs has a wood stove in the garage! Already had play sand and diatomaceous earth (fleas in the house) SO, I added this to their dust bath in the coop. I had filled two small cat litter boxes with just dirt and they had a blast! So I’m sure theyll love the addition of DE and ash! Thanks for all the hints. In fact we have an old tire that needs repurposing! Maybe that will be their new one in the run! When my hens free- range, they always run straight to a bare patch in the grass. They seem so desperate for a bath, so I think ‘why not just make them a dust bath that can always be accessed?’ Thank- you for this helpful page! My wife & I use a plastic below-bed storage container as our hens’ Sand Spa. Shortly after we set our sights on having a suitable dust bath container, I eyed the unused container with its cracked lid in our shed, knew the container would serve as a repository for sand, & set it up as our girls’ “spa.” Although our spa has room for a half dozen mature hens at once, our hens crowd one another when bathing in it. I/ve observed three hens almost on top of one another at one end of their spa, leaving another half of perfectly good sand vacant. Hens are just VERY social! One nice feature of our “spa” is its cover. The cover latches shut, preventing the occasional wandering cat on our property from using the hens’ spa as a litter box. That’d spell contact with feces that chicken farmers do not accept. The container is manufactured by Sterilite. The container measures 38 inches x 20 inches x 6″. It holds several bags of sand, making it too heavy to move without removing some or all of its sandy contents. Thanks for your comments. Sounds like your “girls” have got it pretty good. If you use a ‘container’ make sure no part collects water. it must drain and remain dry. You just need ‘walls’, no bottom. I just find their favorite spots and add above ingredients to enhance it. Occasionally taking a pitchfork or spade to it helps them settle in. G.
We put up a small 2 man tent for our 2 girls in winter , with their sandbox inside. This keeps them warm and dry. I put their hemp bedding all round their sandbox . They spend many hours in their tent when its cold or snowing. They free roam in their fenced off part of the garden otherwise and sleep in their coop at night. Very happy spoilt ladies.!! Thank you. I’ve heard of using the wood ash and sand. This year I will add the soil and Diatomaceous Earth. My flock thanks you, too! New to the chicken family. I think my chicks are 4 weeks old. Trying to get the coop ready. I am planning to make a dust bath, but I don’t have any way to get wood ash. Can i do it with out? I have the DE and soil. Also would you happen to know what is best to put on the ground where the coop ground is.. my husband want to leave it just the grass we have in hopes chicken poop would help fertilize it and make it better. We are in the city limits and backyard chickens. Thanks..